The Ammonite threatened the city of Jabesh Gilead. Jabesh wanted to surrender, but the Ammonites said only if we gouge out the right eye of every one of you to disgrace Israel. When Saul heard the terms at Gibeah, the Spirit of God burned with anger. Saul took oxen, cut them into pieces, and sent the pieces scattered across Israel as a warning to those Israelites who didn’t follow him. The Israelites were afraid and rallied around Saul with 330,000 men. Saul slaughtered the Ammonites. Saul was reaffirmed as king by the people in Gilgal. They sacrificed fellowship offerings to God. 6) Part personal question. My answer: The Ammonites attacked Jabesh, a city in Israel, and wanted to gouge out the right eye of every one of the people to disgrace Israel. They were outnumbered and had little choice without rescue. We’ve had our share of money problems and layoffs. God has always provided. 7) Saul started prophesying (1 Samuel 10:10) and all the people saw the change upon him. He was calm, patient, and humble as he plowed the fields, waiting on God to call him to action. 8 ) Personal Question. My answer: I’m a better person. I act with confidence God is with me. I am God’s child. I do God’s work. This lesson was okay. I wish we could have explored Saul’s actions more since this is a great example of him listening to God. Mostly, we study Saul when he doesn’t listen to God. The Ammonite enemy surrounded this Israelite city, and simply by doing so he made his demands clear. They must either surrender or be conquered. Note this Israeli city is on the East side of the Jordan River, in Ammonite territory. Why gouge out the Israelites’ right eye? First, it was to glorify himself by humiliating the men of this city and all of Israel. Half-blinding the men of this city would bring reproach on all Israel by making Israel look weak and unable to prevent such an atrocity. Second, it would make the men of Jabesh Gilead unable to fight effectively in battle. In hand-to-hand combat the man with one eye has less depth perception and is at a disadvantage to a man with two eyes. How does Nahash represent Satan? Satan attacks us but cannot do anything against us without our agreement. He asks for and requires our surrender. Satan wants us to serve him and will attempt to intimidate us into giving in to him. Satan wants to humiliate us and exalt himself over us. Through humiliating one saint, Satan wants to bring reproach on all God’s people. Satan wants to take away our ability to effectively fight against him. Satan wants to blind us and if he cannot blind us completely, he will blind us partially. The name Nahash means serpent or snake. The men of Jabesh Gilead were in a difficult spot. They were horrified at the demand of Nahash but they also knew they had no other choice. They knew they needed a savior. Why would Nahash allow the Israelites to plead for help? He was confident of Israel’s disunity and figured they couldn’t find anyone to save them. By allowing the messengers to go through all Israel he made his name big and his reputation feared throughout the whole nation. The people weeping was exactly the response Nahash was seeking. Why is the King of Israel working in a field? Saul was the anointed king of Israel, but there was nothing for him to do. He really didn’t know where to begin when it came to setting up a royal court and a bureaucracy and Israel never had one before. So, he just went back home, went to work in the field, and figured God would tell him what to do when the time was right. He didn’t worry. He didn’t try to figure it out on his own. He waited on God, as well should. This was Spirit-led anger within Saul. The Bible says we can be angry, and do not sin (Ephesians 4:26), but most of our anger is selfish. Saul’s anger was not out of a personal sense of hurt or offense, but out of a righteous concern for the cause of the LORD among His people. Why cut up the oxen into pieces as a warning to Israel? Saul delivered a clear threat with the cutting up of oxen into pieces to the people of Israel. The manner of the threat seemed more from the Mafia than from the people of God, but Saul wanted it clear that failure to step up and defend the cause of God at this time was sin, and it would be punished as sin. When the cause is right and the need desperate, it is wrong to do nothing. Doing nothing in such cases is sin, and when it comes to the sin of doing nothing, be sure your sin will find you out (Numbers 32:23). Jabesh Gilead was saved. 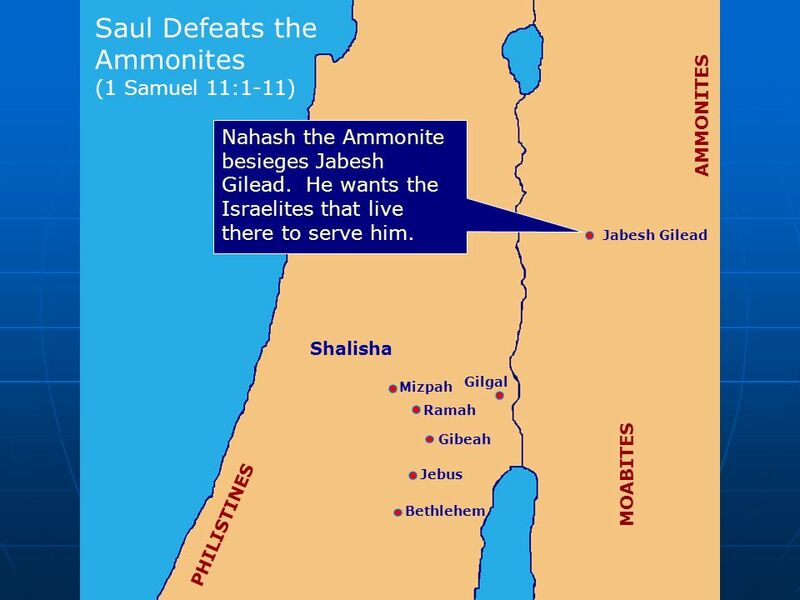 Saul used military tactics and the people lied to Nahash about surrendering and God gave them a total victory. The supporters of Saul wanted to expose and kill those who didn’t support him as king before (as described in 1 Samuel 10:27). But Saul wisely knew this was no time to take revenge on his opponents. Satan, having failed in the attack through Nahash now tried to attack Israel – even in victory – by dividing the nation against each other. Satan will attack us anyway he can, and he often uses times of victory to attack. Saul had to prove himself before many would accept his reign as king. This is not necessarily a bad thing. It is one thing for a person to be “anointed” or “appointed,” but the evidence must be in the doing. God used the Ammonites to prove to Israel His choice. Saul won the outward battle and the inner battle against pride, insecurity, and revenge with the Spirit of God’s help. He loses this Spirit and, hence, he falls as we shall see. Summary of passage: Jesus says the church in Thyatira is improving but they are tolerating Jezebel and her teachings, which lead to sexual immorality and idol worship. Jesus intends to make those who commit adultery with her suffer and will kill her children. Those who haven’t followed her Jesus encourages to hold fast to him. If they do, he will give them authority over nations and the morning star. 6) The Lord commended their improvement in deeds, love, faith, service, and perseverance of him. 7a) Thyatira and Pergamum both were susceptible to false teachings and prophets, sexual immorality, and idol worship. b) She was impudent, shameless, evil, wicked, ruthless, unrepentant, murderer, a thief, and a bully. She abused her power to gain what she wanted. She pushed her religion upon everyone. She was a false prophetess. She almost brought down God’s people (see End Notes for her history). c) She will suffer and her children will be struck dead. 8 ) Personal question. My answer: Jesus is just (punishing according to deed). It challenges me to do right always, to know I will be judged by Jesus, even in the little things. To remember Jesus is not just the “warm and fuzzy” Jesus some churches portray him as; he’s also the final judger of deeds and a healthy fear would be good to imbed in my soul. Conclusions: The questions themselves weren’t challenging; the commentary and meaning behind it all especially in relation to the other churches was. I would encourage all of you to take your time here. Read more than the passage. Really study what Jesus is saying here. Imbed it in your soul. Read commentaries. Ask questions. Investigate. I promise you will be rewarded if you do. That being said, be cautious of commentaries especially ones online. One commentary I read said the children of Jezebel was the Roman Catholic Church and the commentator went on to chastise the church. Obviously, Catholicism did not exist in the first century so this interpretation is extreme. Use common sense and prayer. If something is way out there, don’t believe it. If it doesn’t line up with your beliefs of what is right or what the bible says, then disregard it. Remember, gathering ideas is a good thing; but we also cannot know God’s ways. Man’s interpretations and analysis is not God’s. But we can learn from those around us. Hence, our time sharing our answers in BSF! With practice and God’s guidance you will be able to decipher the good versus the junk out there and you will grow in unbelievable ways. End Notes: Jezebel’s name is synonymous with evil. She was a princess of the Phoenicians and was married to Ahab, king of Israel for political reasons. She worshipped Baal and brought her religion with her (hence God forbid the marriage of foreigners). She convinced Arab to build a temple to Baal in the capital of Jerusalem and set out to exterminate the worship of the One, True God. She installed 850 priests of Baal and slaughtered God’s prophets. 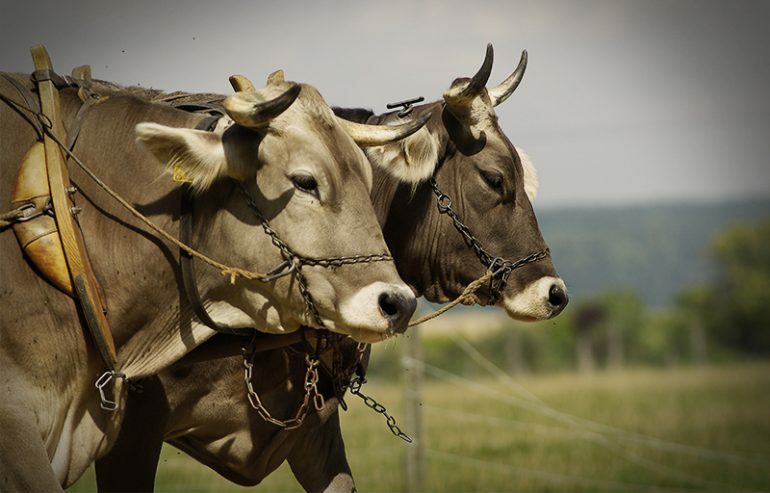 In the end, she died as she deserved–thrown out a window and driven over by a chariot. Her body was left to be ravaged by the dogs, fulfilling Elijah’s prophecy (1 Kings 21). 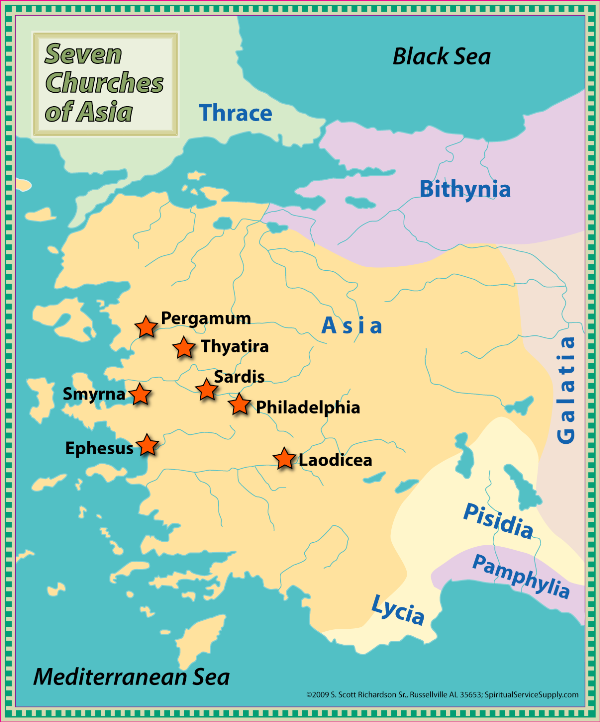 Thyatira was the most insignificant of the 7 cities. It was the smallest and no persecution or suffering of Christians is even recorded in history occurring in this city. Still, it was a city of trade and Acts 16:14-15 mentions Lydia who traded in cloth, a good Thyratira specialized in. Again, fire is judgment here and bronze is pure and steadfast. Jesus picks this insignificant church in the ancient world to show that no one is insignificant in his eyes. He cares for all and watches all. He praises their love, faith, service, and perseverance–4 qualities that mark a good Christian. The people were following a woman who was leading them astray, a false prophetess whom Jesus warned about in Matthew 24:11. Whether her name was actually Jezebel or not, scholars are unsure. Some even speculate she was the pastor’s wife as the Greek words could be indicative of that translation. What is important here is the significance of the name; every Jewish person would have known immediately who Jezebel was and how evil she was in the eyes of the Lord. Her sin was leading others to sin (Mark 9:42). In the ancient world and beyond into Medieval times, a craftsman had to be a member of a trade guild in order to prosper and gain work. Here, in ancient times, trade guilds were closely associated with the pagan gods which would entail sexual immorality and the eating of foods in the people’s worship ceremonies. Note “my” servants. We are all Jesus’s. “Deep secrets” of Satan referred to the Gnostics who all claimed they knew such things. Giving her time to repent is Jesus’s great mercy and love. We are all given time to repent, but the time is limited. The sin was also tolerating Jezebel. The people needed to throw her out and now before she could corrupt others. “Adultery” here is also spiritual adultery. The people were betraying Jesus when they followed pagan ways. The NIV uses “bed of suffering”, which is much closer to another translation of “sickbed.” We know from 1 Corinthians 11:30 that God does use sickness as a method of judgment. The word used here for “bed” in Greek is a banqueting couch. “Suffer intensely” is also rendered “great tribulation” in some translations, which brings up THE Great Tribulation. “Striking her children dead” and the mention of the tribulation here has some scholars saying all this is for future generations–meaning us. Jesus still hopes for repentance “unless they repent of their ways”. He uses punishments as a push towards him. He never loses hope until the last second. “Heart and minds” in Greek is “heart and kidneys.” The heart was the source of intellect; the kidneys emotions. God wants both. Hold on until Jesus comes. We are to hold fast to him until the End. Jesus is encouraging the faithful: “overcome and do my will to the end.” We are to focus on Jesus despite all the immoral crap around us in the world. If we do, we are promised the ultimate reward: the morning Star, which is Jesus himself (Revelation 22:16). Morning star could also be knowledge of God’s ways (2 Peter 1:19). I happen to think it’s both–we get Jesus and knowledge all at once! The iron scepter is a reminder that Jesus shall vanquish the unfaithful. He alone is to worry. Scholars debate when as always–either the millennium rule or the final rule or rule from heaven. The Greek word here translated “rule” means to shepherd. Again, Jesus tells us this message is for all including us. A warning to unrepentant sinners; a ray of hope for those holding on to him. Fun Fact: This is the first and only time Jesus calls himself the Son of God in the book of Revelation. Why? Because this church is heavily engaged in idolatry. My last poll, asking how long it took you all to do your BSF lessons, was actually a suggestion from one of you on my blog. The reader was saying it took her a fair amount of time and was curious if she wasn’t the only one. It reveals that most of you do it all in one sitting with the majority of you doing the questions on a Sunday night or Monday before class. I had a fair number of comments about this as well. Because of the number of hits I get to my blog. The most are ALWAYS on Mondays. The second-highest are ALWAYS on Sundays. Always. In the two years I’ve been doing this, this has been the case. Now what does this say about man (might as well ask since we are studying the creation of man and his nature, right?). Inherently, we don’t like to work. Eden seemed like a great time to me. The “work” seemed not so hard. I imagine petting animals all day long and chit-chatting with God about the weather He’d send. Then work became not so fun. Same here. The daily study questions or “homework” is just that–work. Some days I struggle. Wondering what they are looking for…just like back in school. Some days I spend a while searching for answers. Now how many of us liked school? High School? Junior High? Those days? So BSF homework reminds us (perhaps subliminally) of school. So we procrastinate. Wait till the last minute…putting off the unpleasantness and “pain” of work. You college crammers know what I’m talking about here. So as we study the Bible and ourselves, we discover something: human nature is here to stay. The Bible is timeless because the people in the Bible could be you and me today. People act how they always have since the Fall. Sometimes this is good. And sometimes this is not so good. In this simple example of BSF homework, I’ll let you make the call. In my humble opinion, I believe God speaks to you whenever you open the Bible-whether 5 days before class or 5 minutes. As long as you get it done and you learn and you grow it shouldn’t matter if you’re a procrastinator or not. After all, it seems to me to be human nature…. Summary of passage: Isaiah asks who or what will we compare God to. If we compare Him to an idol, an idol is first cast and then covered in gold and silver chains. A poor man selects good wood (presumably instead of metal or some material more durable for an idol that a richer man would choose) and looks for a skilled craftsman to make sure his idol does not topple. 5a) A craftsman and a goldsmith and a poor man who looks for a skilled craftsman. A craftsman casts the idol in an image and a goldsmith covers it in gold and silver ornaments and a poor man tries to find someone who will make a nice idol without it toppling over. Jeremiah 10:8-16 Idols are worthless, objects of mockery; they are a fraud with no breath in them; they will perish from the earth. Idol-makers are foolish and senseless. The makers are shamed by their idols and when their judgment comes, they will perish. Habakkuk 2:18-19 Idols have no value since a man has carved it; they have no breath in them and cannot give guidance. Woe to idol-makers who trust in their own creation. c) God is Creator; idols are created. God made people; people make idols. God breathes life; idols are breathless. God speaks and God lives; idols don’t. God sees, hears, smells, feels, and answers prayers; idols just sit there. God is everything; idols are nothing. Structurally speaking, God is the action and idols are acted upon. God is the verb. Idols are nouns. God does. Idols don’t do anything. b) Sometimes I envy everything in 6a but as far as actual worship, I am not sure. But I do allow life elements to get put before God–busy deeds such as surfing Internet and just getting caught up in the day-to-day living instead of being still and knowing He is God. I am guilty of allowing life to lead me at times but as always I am trying to keep Him as my center in my fallible human way. I would think these are important to God since they are above the others we tend to remember: don’t commit murder, adultery, steal, or covet your neighbor’s house or wife. Bowing down and praying to foreign idols was a real problem in Isaiah’s time. The influence of foreign cultures and their gods was one of the sins that led to God’s punishment of exile of His chosen people. People were (and are today) easily influenced and didn’t have the benefit of technology and an interconnected world as we do to more easily know the One, True God. We, in the twenty-first century, have trouble relating to such a culture since ours is mostly homogenous in the sense people worship one God. But instead of a physical idol like a golden calf or something, people today do worship other things such as material wealth, people, etc so in this sense we can relate. It’s important to be cognizant of our God, who admits he is jealous over us (of all insignificant things!) and of putting Him first and to make sure He knows He is first in our hearts. Summary of passage: Isaiah says how in the past he humbled Zebulun and Naphtali but will honor them in the future. The people have seen a light, prospered and been happy, relieved their burdens, and will end war. 6) Judges 4:6-10 and Judges 5:18 By having a woman, Deborah, lead them to victory over Sisera. Another possible answer: By having Assyria conquer them in the past (2 Kings 15:29). 7) Jesus goes to the land of Zebulun and Naphtali and begins His message of hope and truth, leading people to the light. 8a) With light you can see. In the dark, you can’t see and are more likely to be afraid. With the coming of light comes an awakening. b) God is light; in him there is no darkness at all. The darkness is not the truth. If you walk in the light, we have fellowship with one another and the blood of Jesus who purifies us from all sin. Conclusions: The challenge passage was difficult to interpret without reading the whole history. I’m still a bit iffy on my answer and am unclear on its overall significance relating to Jesus besides the physical location of his preaching. Summary of passage: Isaiah cries out upon seeing the Lord, “Woe is me!” and says how unclean he and his people are to see the Lord. b) Personal Question. For me, I put I don’t know if He has. I’ll have to think on this one. There are instances where I have known God spoke to me but am unsure about the revealed part. 8a) If you have a good heart, you will say good things. If you have an evil heart, you will say evil things. b) Whether you are good or evil. 9) Personal Question. I put that we should take Him and what He says seriously and always remember we are sinners and only He is pure. Conclusions: Short passage to analyze, teaching us how we should respond when God shows himself. Summary of passage: Isaiah has a vision of the Lord seated on his throne with seraphs hovering overhead, singing to one another, and singing so loudly that the temple shakes and is filled with smoke. 3) Isaiah wants to draw attention to that particular time. 4a) God sitting on a throne, His robe filling the temple, seraphs hovering above with booming voices and creating smoke. b) Exodus 19:18 Mount Sinai was covered with smoke, because the Lord descended on it in fire. The smoke billowed up from it like smoke from a furnace, the whole mountain trembled violently. Revelations 15:8 And the temple was filled with smoke from the glory of God and from his power, and no one could enter the temple until the seven plagues of the seven angels were completed. Conclusions: I think Isaiah is describing what he saw before God speaks to him.